Terrorism 101 provides an insightful and educational read into the "nuts and bolts" of Terrorism. Terrorism is not a new trend. Dr. Leon Newton shows that terrorism has existed for as long as Governments have been in place. He points to historical accounts of terrorism that go back to such early periods as BC 334. Terrorism 101 offers readers a detailed account of the history of terrorism, the role of the media and terrorism, the historical roots of terrorism, countering terrorism, foreign policies and their influence on terrorism, and a historical account of the formation of Al Qaeda. A thoroughly researched reference book, Terrorism 101 presents an enlightened perspective on terrorism. An in depth Appendix and Bibliography provides readers with many works written by other experts in the field of terrorism. With so much written about terrorism, it is often difficult to research the topic to gain an understanding of the motives behind it. 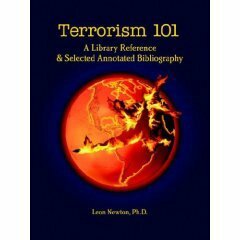 Dr. Newton provides readers with well-researched and factually documented information that helps one understand the various aspects of terrorism. It is a handy resource tool for those seeking to educate themselves about the many issues concerning terrorism. When reading the book, a number of important topics come up. The role of the media and its ability to sway public opinion is one important concern. It would have been interesting to see a chapter devoted exclusively to the Cable Television News Networks. The 24-hour news channels are a powerful tool in swaying public opinion. For instance, when the subject of invading Iraq was placed in the public domain, the 24 hour news channels first tried to show both sides, those for and those against. Later, a bias evolved supporting the pro invasion side, possibly motivated by the thrill of accompanying the military during the invasion, which may have influenced journalists to stop asking the right questions. Much like the "war on drugs," the declaration of "war on terror" and the use of preemptive strikes reveal an unrealistic ideal. The Preemptive Strike Doctrine only fuels the spread of Terrorism. By addressing historical and current events, Dr. Newton points out that "modernizing a culture too fast can lead to a proliferation of terrorists, as those who feel marginalized, powerless, and threatened," become easy prey for terrorist organizations seeking new recruits. Dr. Newton explains that military intervention alone does not stop terrorists. In times of turmoil, losing one's rational perspective, diplomatic voice, and non-military methods aimed at preventing terrorism, can only lead to the further proliferation of terrorists. We see this happening in Iraq. Terrorism 101 provides readers with a rational and comprehensive guide to understanding terrorism and the choices that are available to reduce the spread of terrorist activities with the goal of preventing such horrific events as 911. I highly recommend this well crafted and well-researched book to readers interested in a rational approach to understanding terrorism. It should be an added resource tool for all libraries and personal reference collections. Most people, who shy away from poetry, do so because they believe it is dark and depressing. Fortunately, Armenian born author, artist, and designer, Varujan Ughurlyan, dispels this myth. On first glance, the beautiful artwork stirs up one’s interest to discover more about the book. It is a pleasant surprise to realize the book is more than just a compilation of poetry. A story is unveiled using lyrical verse, narration, and stunning artistic designs that compliment and enhance the reading experience. As a lyric poet, the author creates an inspirational story with vivid poetic imagery allowing one to see and feel harmony with Man, nature, and the universe. By using visual artistic imagery and visual prose, the book becomes a palette with the author painting a philosophical and inspirational story of Man. The book is rich with poetical devices that use uplifting and philosophical metaphors enhanced by artistic imagery. It is a work inspiring self-reflection, respect for the natural world, and the magical wonders of the universe. The story is livened with eloquent symbolism, but not over weighted by it, and enhanced by artistic illustrations. The book inspires self-reflection in a manner both heartening and positive. The story is quick to highlight the universal but stays rooted in the concise and clear utilization of poetic images reflecting the natural world. We are reminded that we are not just observers of nature and the universe. We are part of it. I highly recommend The Dark Side of the Moon to those who enjoy reading inspirational and thoughtful literature about the nature of humanity and our role in it. With a comical theme throughout the book, we experience the manic eccentricities of Robert on a collision course with death, and a young misguided Princeton mathematician at the crossroads of life and death. Debby and Sue’s struggle to save the two lost souls from self-destruction takes them into the dark lair of the Suicide Club. In the club, run by remnants of the drug filled sixties, Debby and Sue meet a group who provide a path of self-destruction for misguided and jaded individuals lost in a sea of depression. A primary theme throughout the book is losing one’s path in life and turning to mind-altering drugs for clarity and answers. There are various references to sixties rock stars who have died from a drug overdose. In the club, there is an emphasis on glorifying the deaths of rock stars while encouraging a nihilistic view of life. The Suicide Club, operated like a Cult, reveals the sadistic pleasure of manipulating one’s emotional pain with mind-altering drugs. An intense brainwashing practice takes place. The novel shows the dark side of glorifying people who die from drug overdoses. There is a tendency to highlight a “liberal media” responsible for glorifying rock stars who have died from a drug overdose. Perhaps, one might consider whether there is a liberal media glorification of rock stars who have died of a drug overdose, but how individuals facing difficult circumstances in their lives, choose drugs as an escape, which triggers a glorification of nihilistic and self-destructive thoughts and behavior. In some instances, the media does highlight rock stars that have died of from a substance overdose, but one might contemplate whether there is an agenda in the media to put them on a pedestal for young people to emulate. For example, the film about the lead singer of the Doors shows the self-destructive behavior of the lead singer as he immersed himself in a world of drug addiction that led to his death. There is a clear anti drug message in the book, but not in the form of a lecture, which is refreshing. Young people would gain much valuable insight reading this book. Although the concepts and ideas put forth in the sixties were positive, they were lost in an abyss of mind-altering self-destructive use of drugs. The story rejects drug use and promotes a path of clarity through self-reliance, imagination, creativity, and a strong will to seek answers without mind-altering substances. It is a definite must read for young people and recommended for all readers.